Her brother Edgar looks a bit less creepy. The two women in the image above might resemble each other, but looking more closely at the one in black might make you feel a bit uncomfortable. 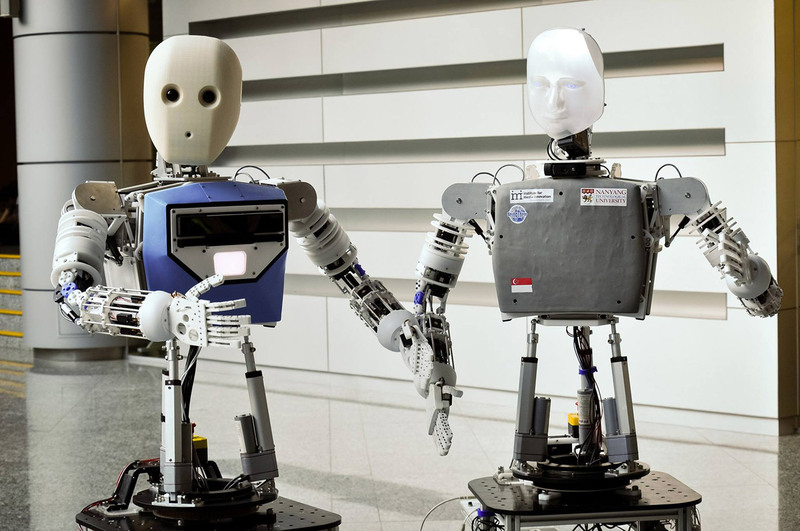 That's because she's a humanoid robot named Nadine, made in the likeness of creator Professor Nadia Thalmann from Nanyang Technological University (NTU Singapore). Nadine is loaded with intelligent "assistant" software similar to Siri and Cortana, with her own moods and emotions. She can also remember the people she'd met before and the contents of their conversation. Professor Thalmann's robotic doppelganger was developed to become a personal assistant or a companion for kids and the elderly in the future. She believes social robots like her creation could eventually become real-life C-3POs "with knowledge of language and etiquette." For now, she and her team are putting Nadine to work as a receptionist at the university. Besides the humanoid robot, NTU Singapore has also unveiled a telepresence machine named Edgar. Unlike his eerily human-like sister, he's what you'd expect a robot to look like, but with two arms and a rear-projection screen for a face. So long as you use a special webcam from your location, Edgar can mimic not only your facial expressions, but also your upper body movements.